Whether you consider it a barbecue sauce or not, I think this classic recipe deserves a page in its own right because it goes so well with many of my grilled fish and seafood recipes. Not only that, I love it on a burger! There's a few websites out there claiming that the origins of Marie Rose sauce goes back to 1545 and King Henry VIII's ship Mary Rose, a British navy warship that was sunk during a battle with the French in the Solent estuary. Well the sauce isn't that old, the story follows that it was in 1982 when the naval chef who was looking after the catering for the Mary Rose restoration crew invented the sauce. Subsequently the name was changed to Marie Rose to make it more French sounding. What a load of drivel! If that's the story and you wanted to make it more French sounding then why re-brand it as Thousand Island dressing? And secondly I remember being served classic Marie Rose sauce and it being described as "Marie Rose" on my avocado and prawn cocktail is the 70's! The most plausible origin is from Fanny Cradock, one of Britain's first TV chefs who inspired a generation. She was famous for her eccentricity, how she verbally abused her long suffering partner Johnnie and some pretty weird culinary concoctions. I remember watching her on TV and that synchronises her with the time when the humble prawn cocktail became the "fail-safe" but lavish appetizer through the 60's and 70's...and I still struggle to see a Michelin starred chef mixing up mayo and ketchup! That said, was classic Marie Rose sauce recipe her invention or a derivation from another sauce recipe, who actually named it Marie Rose and why? That all remains a bit of a mystery but let's once and for all dispel this utter garbage that it has anything to do with sunken ship! You'll see from the ingredients that there's nothing too complicated about making this sauce so there's no excuse for not making it up yourself. Recently we had some friends come to stay and their kids loved Thousand Island dressing so much that they even brought a bottle with them. It's ages since I'd tried some so I had a taste - I almost spat it out! Compared to a freshly made up marie rose....well, there is no comparison. One tastes fresh and punchy, the other tastes bland and processed and I hope I don't have to tell you which one is which! Once last word on this sauce before we get to the ingredients. Don't just reserve it for fish or shrimps, try adding a shake of chili flakes and slapping it on your burger or use it as a BBQ dip. In fact it works a treat on any BBQ menu. Worcestershire sauce contains both fish and gluten. You may also find celery in some brands of ketchup (eg. Heinz). Lastly mayonnaise contains eggs and some brands may contain a little mustard. Note:- You can make a pretty good marie rose sauce without the addition of Worcestershire sauce so if this helps you with your allergies then go right on ahead and leave it out. 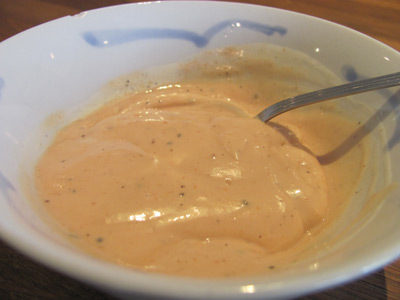 Spoon out the the ketchup and mayonnaise into a bowl and mix them together to give you the basic sauce. To further develop the flavors add the lemon juice and Worcestershire sauce, give it another stir and that’s all there is to it. Some will argue that the prawn cocktail of the 1970's has had it's day and should be firmly confined to the past. Avocado is back in fashion big time and I don't think that there's anything wrong with layers of crisp lettuce, a skewer (or two) of char-grilled prawns and lashings of Marie Rose but don't just leave it there. The flavour combination is fantastic and that little hit of chili / Tabasco leaves a lovely warmth in the mouth.